The amount of break you should read into a putt varies not simply with the degree of slope but according to a number of other factors as well. Perhaps most important, Bermuda grass greens break more than greens of rye or bentgrass. However, no matter what sort of grass you're playing on, you should allow for more break under each of the following situations: (1) on a hard-surfaced green, (2) in dry, sunny conditions, (3) when the grain of the green grows in the same direction as the slope, (4) when putting downhill, and (5) when you*re putting straight downwind or a crosswind is blowing down the slope of the green. In each of these situations, the speed of the putt will be increased, calling for a softer, more slowly rolling putt that will be more influenced by the various factors. 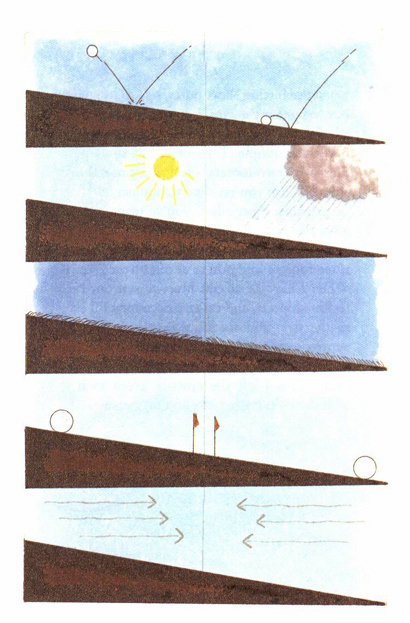 Conversely, you should play for less break when (1) on a soft-surfaced green, (2) in rainy conditions on a wet green, (3) the grain of the green grows in the opposite direction of the slope, (4) putting uphill, and (5) you*re putting into a headwind or when a crosswind is blowing against the pitch of the slope. These conditions call for a putt that must be struck more firmly, and when you do that, you always play less break. GregNorman.com / Shark.com © 1999 - Present. Greg Norman Interactive, LLC. All rights reserved.